Knurl is a small projecting knob or ridge, especially in a series around the edge of something. The process of forming a pattern on the exterior surface is called ‘Knurling’. It is mainly a forming process. Knurling is done on the parts for better gripping and handling. The process usually carried out on a lathe machine using a form tool called 'Knurl'. What does knurling do? 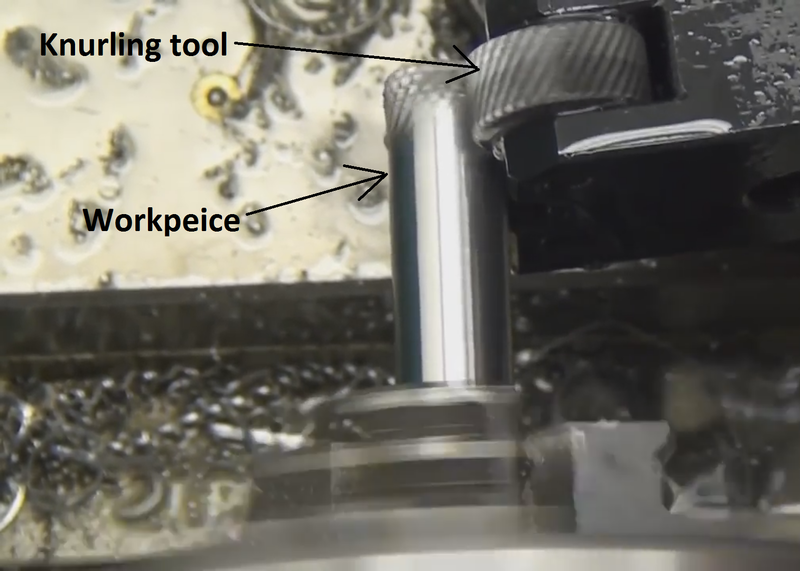 Knurling is often done at the same speeds used for turning operations. But it is advised that, for longer tool life, the speed of rotation should be set low. The recommended speed for knurling is 50 meters per min. It can be varied depending upon the type of material and tool. By slowing down RPM of job you will get longer knurl life and better finish. How to Use a Knurling Tool? Below video will show you how to use a knurling tool. At first, the lathe operator will slow down the speed of chuck and mount the workpiece. He will then press knurl against the round bar or work-piece surface. The pressure is then slowly increased. To obtain a diamond shaped pattern the operator will stop lathe and reverse the direction of travel of the tool.